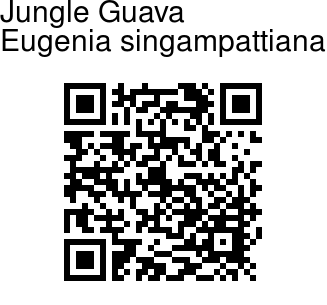 Jungle Guava is a critically endangered small evergreen medicinal tree, with branchlets round, hairless. This species is categorized as endangered or possibly extinct by Botanical Survey of India. It was named after the Singampatti Hills in Tamil Nadu. Leaves are deccusate, 5-8 x 2.5-5 cm, ovate or elliptic-oblong, papery, nerves 13-15 pairs, midnerve prominent below, hairless, base heart-shaped or rounded at base, margin entire, blunt or tapering at tip; leaf-stalk very short. Cymes at branch-ends in short racemes; bracts and bracteoles velvet-hairy, 0.8-1 cm long; flower-stalks to 1 cm long. Flowers white. Calyx tube 3 mm long, lobes 4, to 4 mm long, sub-round, persistent. Petals 4, glandular, to 12 mm long, ovate, inprominently dotted and prominently nerved. Disc small. Stamens numerous, erect or incurved; filaments 1-1.5 mm long. Ovary subspherical, 2-celled; ovule numerous; style 8 mm long. Fruit is a nearly spherical berry, 2 x 2 cm, crowned with sepals. 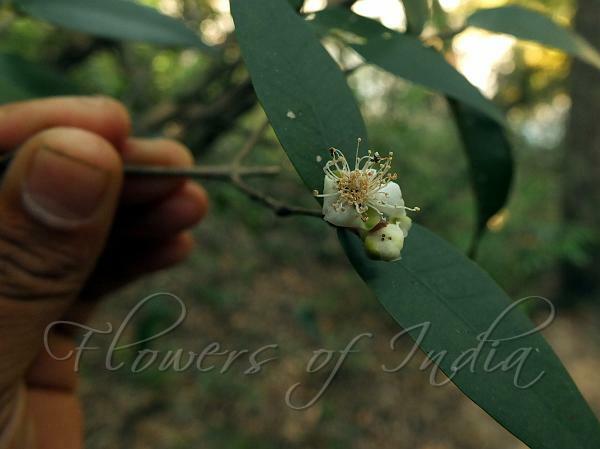 Medicinal uses: Jungle Guava is known to the locals as Kattukorandi; they use this plant to get relief from toothache, digestive problems, asthma, giddiness, body pain, rheumatism, gastric complaints and also as mouth freshener. A paste prepared from equal quantities of leaves and flowers are consumed to cure body pain and throat pain and tender fruits are consumed to relief from leg sores and rheumatism. A paste, prepared from equal quantities of stems, leaves and flowers, is consumed with palm sugar to get relief from gastric complaints. Identification credit: Siddarth Machado Photographed in Kalakkad Mundanthurai Tiger Reserve, Tamil Nadu.